When you’re setting up a manual coating line, one of the main decisions you’ll have to make is which powder coating gun system best complements your operation. To help you make your decision, we’re taking a look at the top three manual powder guns on the market – from Wagner, Gema and Nordson – to see what each one has to offer. Disclaimer: For the purpose of this article, we’ve limited our reviews to these three manufacturers. 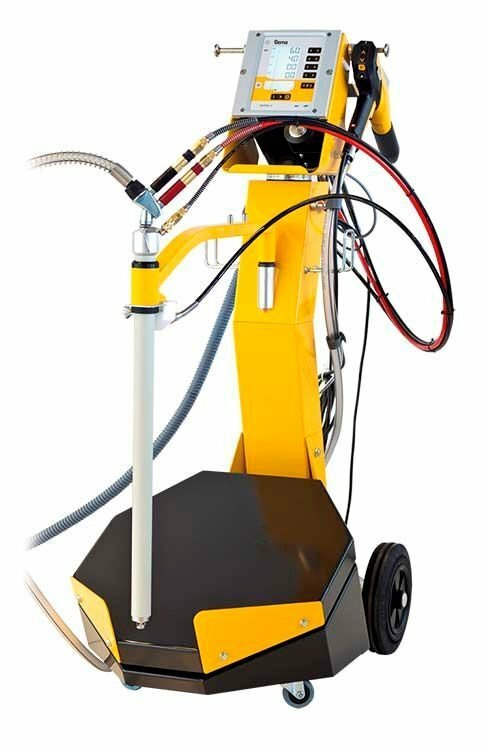 While there are many other powder coating guns out there, these three brands produce the best available guns in the powder application industry. 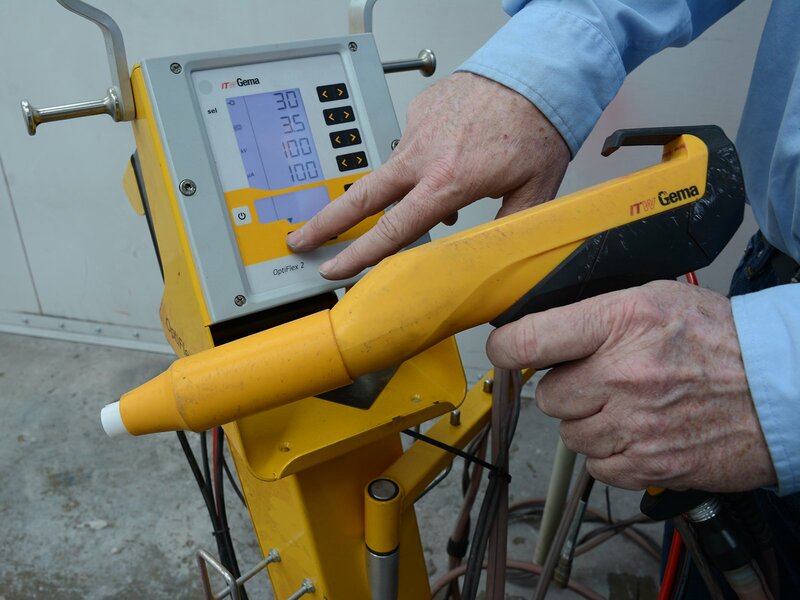 Since your coating success is ultimately determined by the quality of the finished product, having a powder coating gun that can give you consistent and professional results is vital to your operation. All three gun systems are well made and have great track records for performance and reliability, but they have subtle differences. Here’s a simple chart with some key specifications so you can see a side-by-side comparison. The units listed are the basic vibratory box-fed models without any customization. 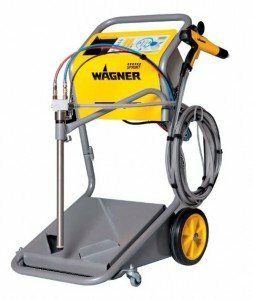 The Wagner Sprint X is the lowest priced of the brand name, premium quality manual application units. Because of its lower price, the Sprint X is extremely popular with first-time buyers, but the consistent results it provides makes it a top-choice for established operations as well. The warranty is adequate for most buyers and Wagner is noted for having common repair parts available on short notice. Like previous Wagner models, the Sprint X includes both upgradability and backwards-compatibility features that the other units can’t match. Wagner introduced a new controller design a couple years ago with all of the key functions tied to an intuitive rotary dial. It provides a great deal of flexibility for different types of powder and varied coating situations. It’s very easy to assemble the gun, plug in the cables and hoses, and start shooting powder using the three main presets. However, if you like to have lots of custom settings for different powders and coating situations, you can program up to 47 more settings into the unit’s memory. With 50 total presets, the Sprint X has more than twice as many available settings as the other guns in this review. The 450 gram-per-minute application rate is also the most powder output of any of the units reviewed. 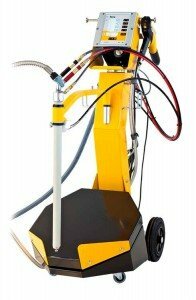 Although the unit is capable of finely-controlled powder application, it is a natural choice if “blow and go” is your preferred method of powder coating. Wagner introduced a new gun several months ago with the Sprint X designation. The result is a smaller and lighter design, and you can adjust powder volume on the gun without having to walk back to the main controller. Because of the change to the lighter design, the current gun is a bit more fragile than some previous models. Try not to drop it or over-tighten its plastic screws when taking it apart for inspection or component replacement. The Gema Optiflex 2 is the most expensive of the three gun units reviewed, but that price includes incredible durability backed up with the best warranty provided by any of the major brands. 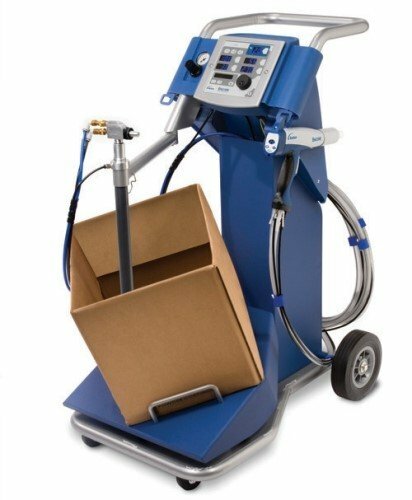 If you are looking for a powder coating gun that will work – and work for a long time – then the Optiflex 2 is a great choice. The Optiflex 2 powder coating gun is very easy to pick up and start coating with. It is easy to assemble and sprays excellently out of the box. The pump picks up the powder smoothly and has little to no built-in surge when triggered. In our experience, the Optiflex 2 sprays the “softest” of the three units. This can help with multiple coat situations, like when you are spraying candy colors. The system has a total of 20 presets, which is adequate for the vast majority of coaters. The gun is a bit heavier than the other models reviewed, but it is robust and easy to use. Like the other guns, it has limited controls built-in. When needed, the 395 gram-per-minute output is more than enough for most applications. The PCC mode helps with Faraday cage areas and tight corners by pulling some of the free ions out of the charge field. This allows operators to get closer to the part in difficult areas and perform detail work without having to change settings. The Encore XT is the mid-priced powder coating gun in this review. We were pleasantly surprised by the price since Nordson has historically been the highest priced manual gun option on the market. Nordson is very well known for their high-end automatic guns and spray systems, and we were glad to see their latest model meet their high-quality standards while still being very price-competitive. The Encore XT model features 20 presets, allowing you to customize up to 17 settings that be saved by the controller. As an added convenience, you can cycle through the settings on the gun itself so you don’t have to walk back to the main unit to make a change. The gun is also surprisingly light and easy to wield. One thing to note is that the maximum powder output of the Encore XT is a good bit less than the other models. This system seems best suited for skilled coaters who appreciate finesse. With that said, the Encore XT features an AFC mode. This helps new or less skilled operators by adjusting the electrostatic settings automatically using feedback based on the gun-to-part distance. This mode is especially helpful when dealing with tight areas and Faraday cage issues. For price sensitive buyers, the best option is the Wagner Sprint-X. The Wagner powder coating gun is the lowest priced model with the most affordable replacement parts. For maximum versatility, pick the Wagner Sprint-X . With more available setting and much more powder output, the Wagner gun is a great choice for operations coating many different types of parts. For high-end performance (for high-end fabricators or automotive/custom work), the Gema Optiflex 2 provides a softer spray and a PCC mode that allows you to easily coat items with odd shapes. For longevity, you can’t go wrong with the Optiflex 2. Gema has a great industry reputation for the durability of their powder coating guns, and the Optiflex 2 will last you for years. The warranty is also the best in the coating gun industry. However, the replacement parts are more expensive, so keep that in mind if price is a factor. If you are planning on expansion, then the Nordson XT is the way to go. If you want to upgrade to an automatic line in the future, or you’re adding a batch system to supplement an existing automated line, Nordson’s Encore XT is a great complement to their well-respected Encore automatic guns. The parts are fairly interchangeable and your operators will not have to learn a new control system. No matter which gun you choose, any of the three manufacturers we’ve reviewed will provide you with high quality equipment that will produce a finish you and your customers can be proud of. This entry was posted in News on March 4, 2016 by Bruce Chirrey.